As owners of an original first-year S2000, we’ve been very protective of the car for the past 15 years. We’ve watched closely as Honda tested prototypes and Gan-san drove a production model in Europe. Then we test drove one on the back roads of Nevada, bought one, babied it, pampered it, put it on a pedestal, and laughed as it continued to out-perform newer Miatas, RX-8s, and the Scion FRS/Subaru BRZ. And why not? With unparalleled performance from its 120-HP/liter engine (one of the all-time top naturally aspirated engines ever), excellent handling, deep sports bucket seats, and the all-time best shifter, there has never even been a pretender to the throne. So when Honda all but left the performance market over the past 15 years, failed to produce any significant new engines over the past 10 years (foregoing any further performance development of its existing 4 cylinder engines, and doing nothing significant with its SOHC V-6), and overly focused on “green” rather than fun (Sochiro would say that both are compatible), we waited impatiently. We knew that Honda would some day do something of interest again. That day is fast approaching. 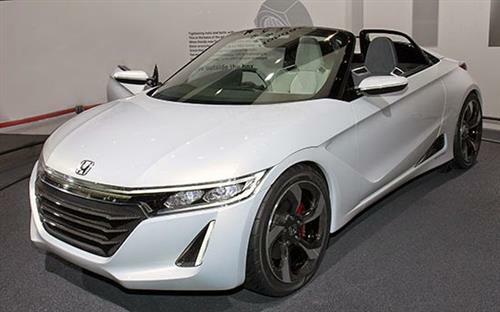 With a 300-HP 168 MPH top speed Honda Civic Type R coming to Europe and Japan at the end of this year (but not North America), a new NSX shown in final production form at the 2015 NAIAS (designed and built in North America), a new S660 (not for North America), and significant investment in a new transmission (designed in-house: 8-speed, DCT) in two families of turbocharged engines (all-new small displacement engines, and a significantly updated K-series) with Direct Injection across the line – we’re encouraged. Even though the new engine, transmission, and DI investments were made (finally!) several years behind the competition. The NSX is a hyper-car, with everything but the kitchen sink added in, and will be far too expensive for potential owners of even above-average means. Where the last one was a financial stretch for this class of owners, the new one is impossible. The Civic Type R is a last-minute update of an existing and very old platform: note the beam-type rear suspension (odd that the North American Civic uses a fully independent rear suspension). It’s purpose is to hype up the overall Civic line until a new one can be brought to market in a few years. We don’t want the Civic Type R in North America, we want its replacement. And then there is the S660. It begins production with a .66 liter engine, providing 63 horsepower and 77 lb-ft of torque. It won’t be coming to North America, at least in this form, and hopefully not at all. It won’t sell with this power, and it won’t sell in this size. 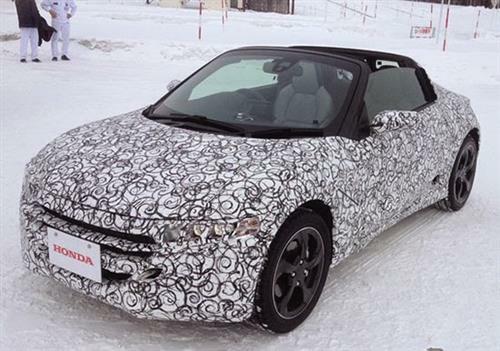 Here’s a pre-production prototype undergoing cold weather testing. The front view is attractive. Note the front seats, with good support for the shoulder blades. But then we see this rear-side view. 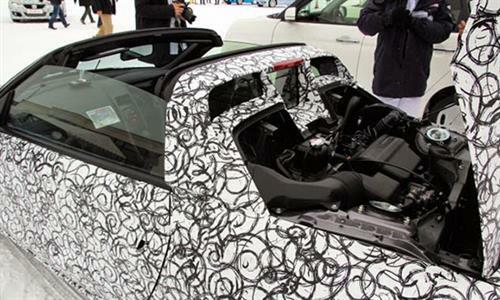 The S660 has a removable hatch, it’s not a convertible. The B-pillar will certainly provide superior roll-over protection, but at the expensive of having three very strange rear windows. We can also see the transverse engine, and a substantial brace behind the strut towers. Yes, cheap struts, because when you borrow platform parts to reduce costs, this is what you get. Forget about superior camber curves. 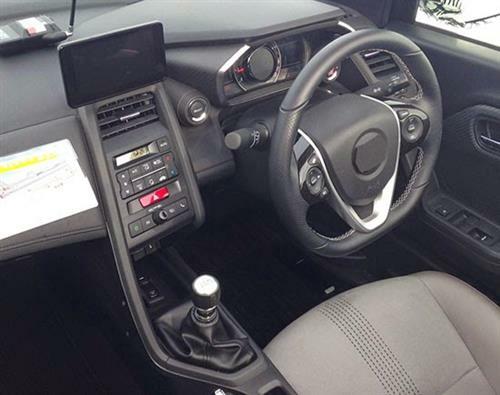 The interior is driver-centric, with all controls close at hand. 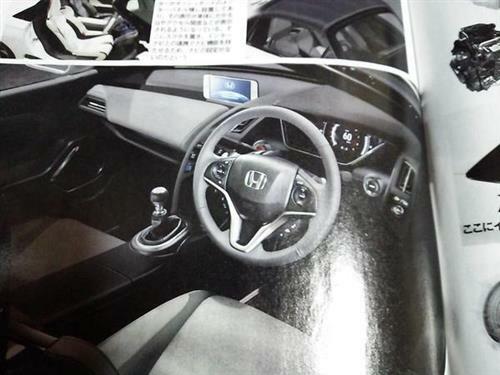 We’re glad to see that Honda didn’t use a Civic-like 2-tier dashboard. 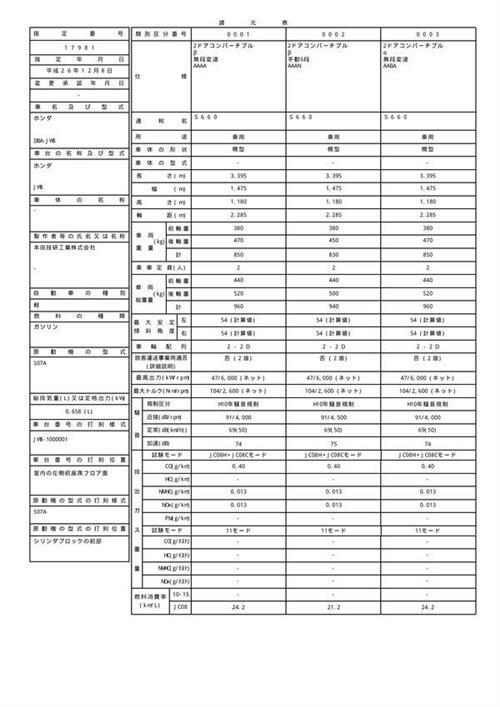 The nav/entertainment system, in a tablet-like form, is all the rage in Japan these days (note the same format from Mazda. It’s much better than the other rage from Japan these days: 2 stacked screens, each with a different resolution LCD, and even duplicating some functions. The Infiniti Q50 is the worst example of this.). Oddly, we see a mechanical-style sweep tach and a digital speedometer. The overall effect is not very attractive, with a preponderance of angular shapes to no purpose. The S660 makes use of components from a Honda front wheel drive car, with the engine and transmission simply moved to the back. As in the same way Toyota brought the original MR2 to market. Undoubtedly the front suspension uses struts as well. This type of component-reuse saves considerable development money and provides a product that couldn’t exist if a totally new chassis had to be developed from scratch. 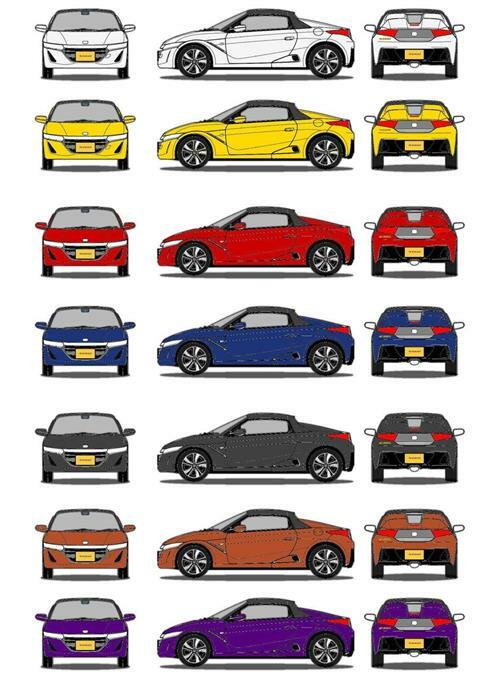 A concept car was first shown at the 2013 Tokyo Motor Show, and cryptic statements by Honda execs suggesting that a variant of the S660 with “significant” changes (implying engine size) could be sold North America. Frankly, we hope not. It’s just too small and even with a full liter of engine would still be too slow – despite a 2100 pound curb weight. But there is a value of the car to Honda beyond just the product. Japanese home market buyers, especially young ones, have been loosing their enthusiasm for sports cars over the last ten years. With most people crammed into huge cities, working well over 40 hours a weeks, and with expensive parking and huge insurance costs, enthusiast cars are not selling very well at all. Add to that the economic problems of the past 10 years and the market for these types of cars isn’t viable. The S660 could help change that: it’s small, cheap to own, and will be inexpensive to insure. This could help rebuild the low-end sports car market in Japan. A market that has seen the sales of the Toyota FT86 dangerously shrink (it’s development costs were low, simply reusing major parts from a Subaru family sedan and a development of a family engine), a replacement for the very expensive to own Fairlady Z (370Z) delayed yet again as Nissan dithers for many years over the direction of the market, and Toyota bringing a Supra replacement to market that uses a BMW chassis and engine. At least the car companies are trying… we’ll see if the potential buyers respond. 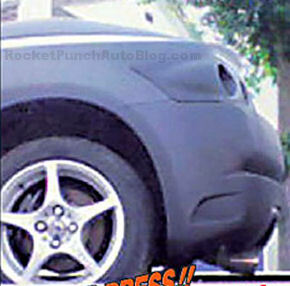 Incidentally, and as an aside, the Japanese home press scored spy pictures in 2008 of an early Honda styling buck for the eventual S660. The dark car below is a clay or fiberglass model that eventually led to the production S660. 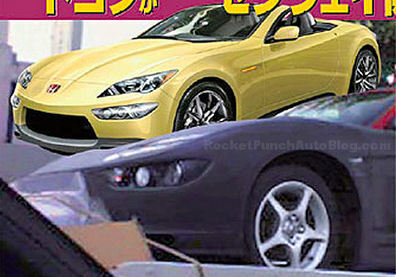 The yellow drawing behind it is speculation from Best Car magazine that this is actually an S2000 replacement. It was not: note that the yellow car is a front/mid engine car like the S2000 (note the distance between the front wheels and windshield) and the styling buck is a rear-engine car (again, note the distance: no room for an engine there!). Best Car magazine let their enthusiasm get ahead of themselves. The production S660 does compare well to Honda’s first car on the market, the S500. That car took Honda into the automobile market and was built for the pure joy of driving, with an excellent shifter and a half-liter roller-bearing 4 cylinder engine that revved to 9000-RPM. We recently drove the last evolution of that car, with a .8 liter engine, and loved it. Any S2000 owner would immediately recognize the familiar feel, the excellent handling, and the engine sounds it made. A true sportscar for driving enthusiasts. And this is just the problem. We want a follow-on to the S2000. The S660 is not and never will be it. It’s too small, it’s too slow, and the handling from this FWD-adapted platform will be very different from that of the S2000’s front-mid engine rear wheel drive architecture. And look at the engineers standing around their S660 in the spy pictures above: we have to think they are thinking the exact same thing. What we want here in North America (and the rest of the world as well, as worldwide economies improve) is a true sportscar, as the S2000 was. Listen up Honda. What you are doing is fine, but we want an S2000 replacement. A worthy one. We understand the reality of the economics, and that a dedicated chassis is impossible. So if that means using next-gen Civic components, moving the front engine to the middle, and using your turbocharged 2 liter from the Civic Type R – we understand. But it still has to be a true sportscar, with minimal compromise. Sportscars are for the purist: it’s all about the driving and handling experience. Any comfort or convenience that would draw attention away from the road is strictly secondary. Rear wheel drive. Frontand AWD not allowed. Econobox drivetrains moved to the back are not allowed. The S2K is a purest sportscar with rear wheel drive. Dedicated purpose-built chassis: not taken from a sedan platform. The S2000 has a dedicated chassis not sharing design with any other vehicle. 2 seats: not designed to carry more than 1 passenger. The S2000 is a true 2-seater. There is no possible provision for rear seats. Inexpensive-sportscars cost more than a sedan, but not in the realmof exotica. TheFerrari Enzo is the pinnacle of its market spaces, but a true sportscar is and has to be in reach of more people. The S2000 costs about $33,000. The S2000 styling makes a statement about the modern technology underneath the body and inside the engine compartment. It’s purpose beyond that is simply to contain those items. There are no styling cues for looks: no fake hood scoops or other poseur statements. Luxury takes away from the driving experience. The purpose of the S2000 is to drive – not to be coddled. The seats are very supportive – and unlike some other brands, the US model doesn’t get “American-ized” (wider) seats. All of the controls are centralized around the steering wheel and can be adjusted while keeping hands on or very close to the wheel. The radio is covered when not needed. The purpose of the console is to support the arm which in turn supports proper shifting (and the S2000 has the best shifter in the world). Ready to go right out of the box. The S2000 was literally ready to go to the track right out of the box. I added the minimum required modifications (for safety purposes) that any track car should have: braided stainless brake lines, track-specific pads, and a very mild alignment (to protect the tires). There are very few sportscars you can say this about. There are almost no other cars other than exotics that you can say this about. Aftermarket performance parts should be added as enhancements and not as requirements to make up for faulty design. 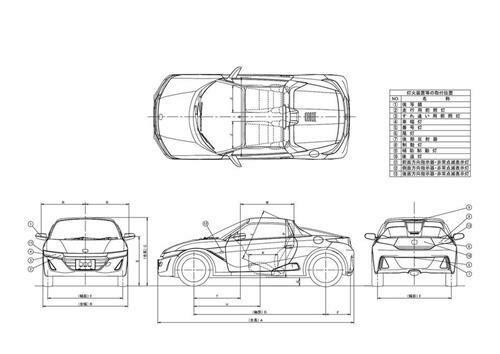 We’ll grant that a modern S2000 would be offered with luxury and safety features including a navigation system. That’s a given in today’s market, and a good hedge to win over more buyers who wouldn’t look at the car otherwise. Even the Japanese domestic market S2000 had a navigation option. Sinatra and Honda understood the feeling. That, Honda, is what we want. The S660 isn’t it, but an S2000 would be, must be. So we’re waiting. S2000…. after the LS7 engine swap!